​The figure to the left demonstrates a good chest stretch if you have a sense of balance and a FIT BALL. Hold the stretch (by relaxing in this position) for two – five minutes. To increase the stretch, hold a small weight of less than 1kg in both hands, but only if your shoulders are not sore. If this position causes sharp pain, rather than mild stretching discomfort, stop the stretch and pursue other types of chest stretches at this stage. It may seem strange to stretch the chest to relieve upper back pain, but such activities as leaning over a computer, working with tools of the trade, house cleaning, or in my case performing remedial massage, cause the chest muscles to contract. As a result, the muscle fibres of the Trapezius and Rhomboid muscles in the between the shoulder blades are pulled into an elongated and weakened state. The rationale behind the treatment is that by stretching the chest, the overstretched, weaker muscles in the back reset to a shorter length, which causes a spontaneous strengthen of the sore back muscles, correcting posture and relieving pain - TRY IT - be gentle 'and' patient with all your stretches. This figure to the right demonstrates an additional way to stretch the chest, probably a better way for those of us that are not sure of our balance. 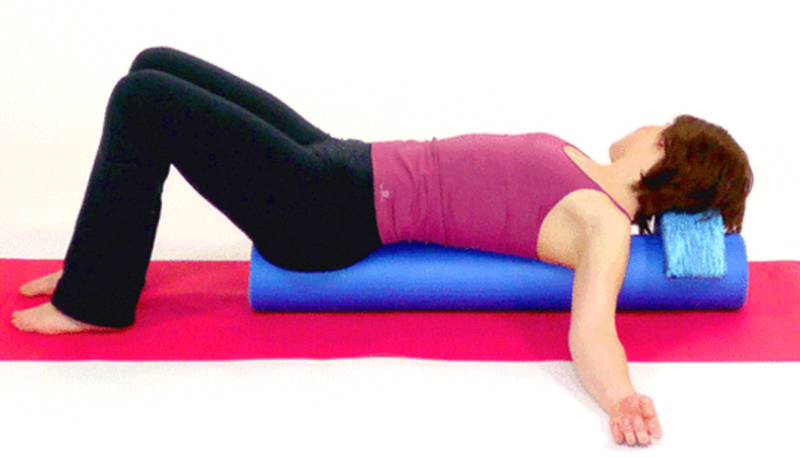 A foam roller is best, or some tightly rolled-up towels will do at a pinch. 1. Place the roller on the ground, and start by sitting on the end of the roller with your knees bent. 2. Now slowly lie on your back with your arms helping you balance. 3. Next, allow your arms to drift out into a stretched position as shown to the left. The figure to the left demonstrates an effective exercise to mobilize the thoracic area of the spine. 1. Firstly sit on the floor and lay down with the upper back and neck resting on the roller. 3. Be careful that you don't roll down as far as your lower back - unless you are confident of your strength. You may hurt yourself! 4. Careful not to pull hard on your neck. Given that people with upper back and shoulder pain, often have neck pain as well. ​5. Eventually, if you have sufficient core strength, you should be able to roll from neck to hip. Thus mobilizing the whole spine.